Rusty Brown was the only angler to catch a double-digit sack on each day of the WON Bass U.S. Open. 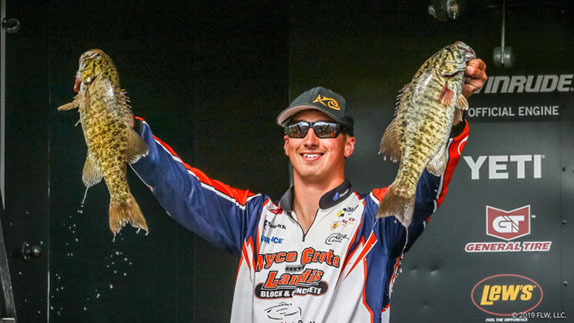 Three straight bags in the 10-pound class won't garner an angler a great deal of loot in most high-level tournaments. It's a heady feat at Nevada's Lake Mead in September, however, and Rusty Brown was the only one out of 142 WON Bass U.S. Open competitors who managed to pull it off. Brown, who runs a guiding business in Southern California, caught a 10.81 stringer on day 3 to close out his first U.S. Open victory in his 12th appearance. 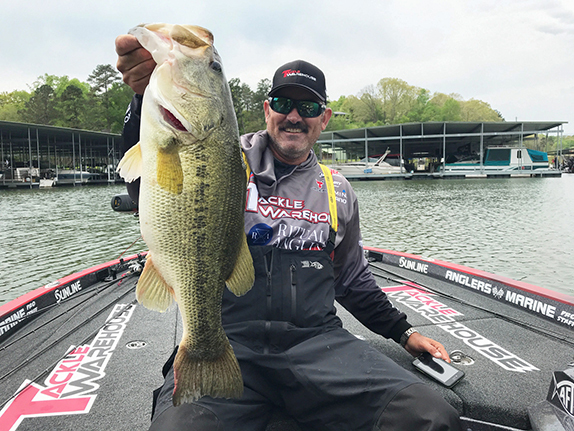 His 31.25 total held off a couple of established tour pros from the region, including a two-time winner of the event who closed with an almost-unheard-of 15 1/2 pounds to nearly steal the victory. 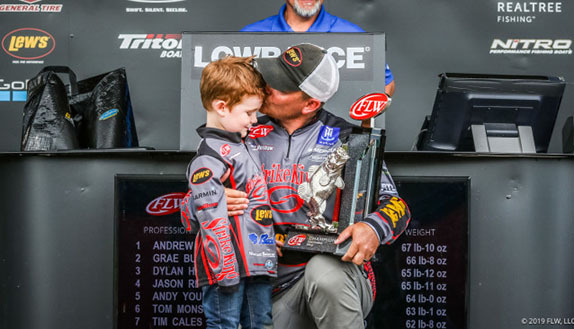 Cliff Pirch, coming off a strong debut season on the Bassmaster Elite Series after a stout tenure on the FLW Tour, was attempting to join Mike Folkestad and Aaron Martens as the only three-time U.S. Open champions. His monstrous final-day sack nearly put him in that circle, but he ended up a little less than a pound short with a 30.32 aggregate. 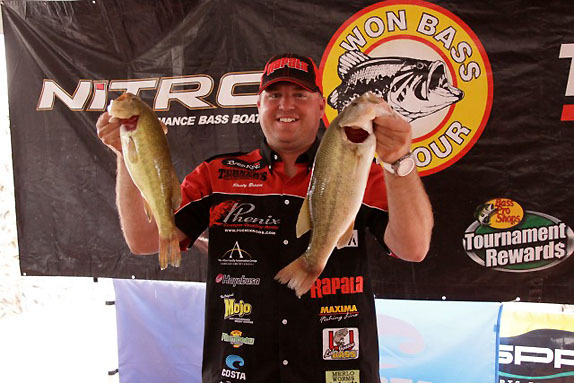 FLW Tour pro Brett Hite, the day-2 leader, slipped to 3rd after a 9.03 haul on day 3 left him with a 30.09 total. Justin Hanold (29.66) and Tommy Jonovich (29.62) rounded out the Top 5. Brown said he's long dreamed of winning the U.S. Open and is humbled by the achievement. "I can't believe I'm standing here with my name on the same list of the guys I've watched win this tournament for so many years," he said. "I've got great sponsors who have stood behind me in working at this for many years and it's really great to be one of the guys who have won this tournament. "I fished really hard for 3 days after a good practice and I knew that if I just kept fishing without getting in a hurry, I would get the right bites. Everything went great this week and I couldn't be happier with the result." He caught his fish on a Rapala Skitter Walk, a Rapala Vixen, a spinnerbait and a Storm Arashi square-bill crankbait. Full details of his winning pattern will be published soon. Last year, Pirch lost his biggest bite of the final day and was edged out for the victory by Sean Stafford. This time he brought a 5 1/4-pounder to the scale � the biggest fish of the event by more than a pound � and gained a whopping 41 places in the standings. Cliff Pirch's massive final-day bag wasn't quite enough to give him his third U.S. Open title. "Anytime you finish on a high note, you feel better about it," he said. "I would've liked to have pulled it off, but in all honesty, catching a big bag like that was the only prayer I had. It was a great day." He had only about 6 pounds in his livewell at 1:00. He'd found some quality in practice, but was unable to reconnect with those fish on the first 2 days of the derby. "I knew I needed to find the fish I'd gone after originally, and I found that group at the end of the day. I just kept my head down and kept going down the bank trying to find them � it was one of those deals where it could be just miles and miles and miles of nothing. "I left them biting because I didn't know how rough it was going to be heading back (to the launch) and I had a long way to run. I was catching them on almost every cast and my last one was a 2 1/2-pounder. I got back with 12 minutes to spare, so maybe I should've stayed just a little bit longer and culled one more time." He caught his key day-3 fish on his own Clifford Pirch Outdoors clear-water casting jig. He picked up a couple on a Spider Bait � another creation of his that he describes as sort of a cross between a spinnerbait and an umbrella rig. It's much smaller than the vast majority of U-rigs and carries two baits. Hite couldn't find fault with his final-day performance; he simply never got the bag-boosting bite he needed. "I did everything I could and I ran all the water I had," he said. "I just came up one good fish short � I never got that 3-pound kicker. There were a couple of spots I could've gambled on, but where I was fishing had the healthiest fish. "I did lose one good one on a topwater this morning, but I don't think it would've won me the tournament." He plied shallow water in the Overton Arm throughout the event. His primary offerings were an Evergreen Shower Blows topwater, a dropshot rig with a Roboworm or a Yamamoto Senko and a swimjig with a Swimming Senko trailer. He used Sunline Shooter fluorocarbon on the swimjig and SX2 braid line on the topwater and the dropshot � the latter with a fluorocarbon leader. > For complete final results, click here.